Check out our NEW! 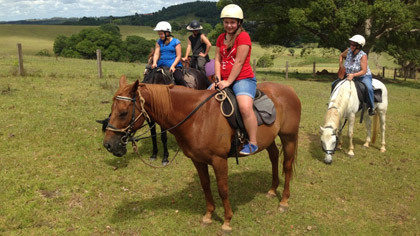 Day Ride, which includes pick-up, drop-off, beach ride, trail & hinterland ride as well as lunch and photos. The groups are limited to 8 riders Max and four riders minimum. You can meet us at our ranch at 8:30am and check out the horses being loaded or alternatively you can meet us at 9:30am at Cheeky Monkeys in Byron Bay where we will pick you up to start your Day Ride. We then travel take you to 7 mile beach at Lennox head where you have the beach to yourselves for an exhilirating beach ride on one of the most isolated beaches in Byron & Ballina areas. 7 mile is a true gem to ride, with the open beach and natural surroundings. During our rides we have been lucky enough to see dolphins playing in the surf, eagles nesting and winter is particularly nice with the chance to see whale migrating. After lunch we then take you on a hinterland and trail rail ride along Byron Creek where the local platypus lives, then up onto a hill with great views of Bangalow and surrounding countryside. To complete the day, we wash our horses down and feed them. Finally we will head back to Byron Bay, where we stop for more photos at Hateys Hill, hosting spectacular views of Byron Bay as the afternoon draws to an end. Drop-off back in Byron Bay at approximately 3:30pm. All of this for the special price of only $275 for our introduction of the ride to our programme. A great way to spend the day. To conduct the day ride we require a minimum of 5 riders. *Please note the day ride runs normally runs on the first and third Monday of the month. Beach ride at 7 mile beach, Lennox Head. Lunch via Killen Falls the locals waterfall hideaway. Hinterland Trail ride along Byron Creek. Drop-off back in Byron Bay at approximately 3:30pm. New! Don’t miss out on our new horse ride. Call us to book. A great way to spend the day.